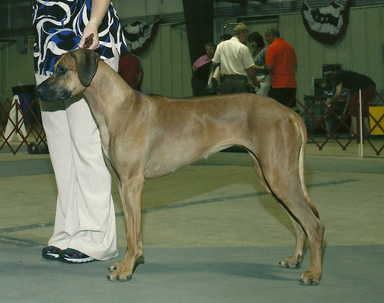 Ember was bred by Deborah and Thomas Adams of Orangewood Rhodesian Ridgebacks in Valley Center, California. Ember is red wheaten with a black nose and mask. She is 77 pounds and is 26 inches at the shoulder. 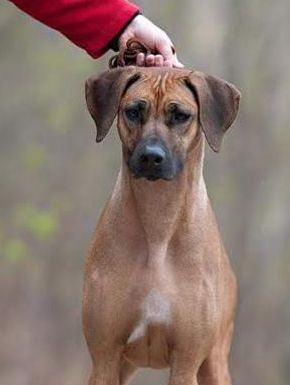 She is a standard sized Ridgeback that has a feminine Build. Ember is very sweet and passed this trait onto her puppies. She has a little bit higher energy than some of my past dogs but did not seem to pass this onto her puppies. Her puppies are sweet and confident. 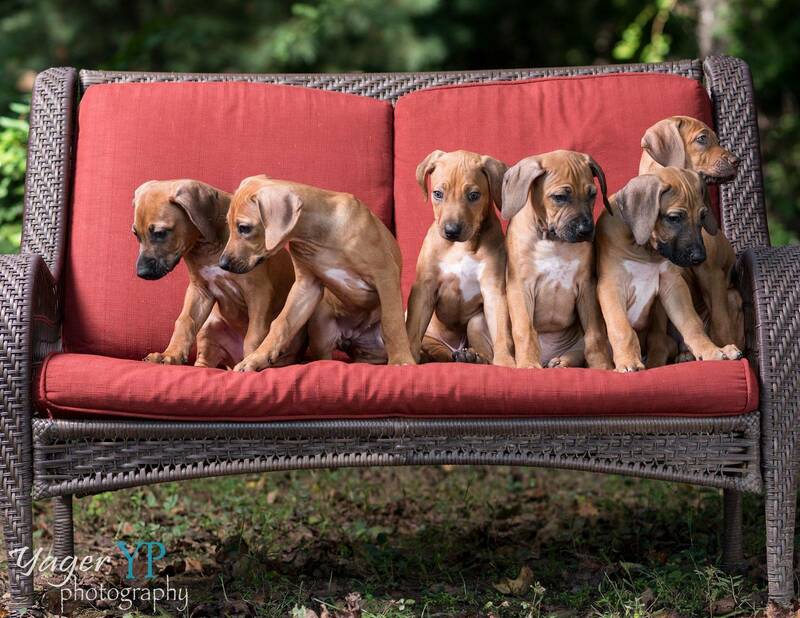 Her puppies were holter monitor tested for this as the test became available after they were born. All health certificates are available upon request. 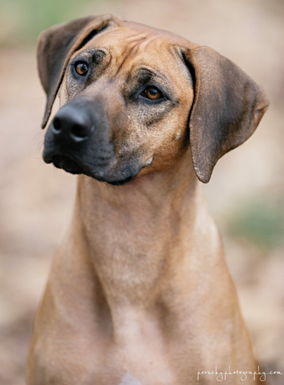 Allergies: Ember is not allergic to anything and does not appear to have any food sensitivities. Even though Ember competes in shows and performance, she is still first and foremost a spoiled companion. she loves her blankets and soft beds. She has FOMO (fear of missing out) so you won't be able to grab your keys and get out the door without her knowing. She loves to ride in the car and loves to go explore new places. She has a decently high prey drive so will chase anything that moves. She loves stuffed toys and will do basically anything for treats. At 8 weeks of age Ember flew under the seat on an airplane with me from San Diego, California to Baltimore, Maryland. She did fantastic and all the worries I had were for naught. Completed her first puppy Kindergarten class the beginning of August, 2012. September, 2012 became an AKC Puppy STAR and completed her second basic obedience class. 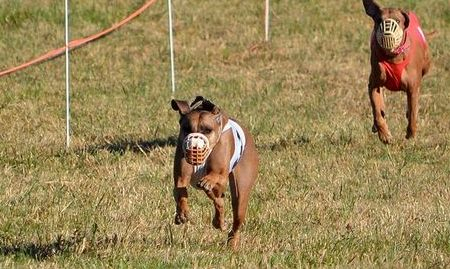 Canine Good Citizen at 6 months of age at our 2012 Nationals (then she promptly ate her ribbon). 20140714 Completed her AKC QC on June 14, 2014 certifying her to run in AKC trials. 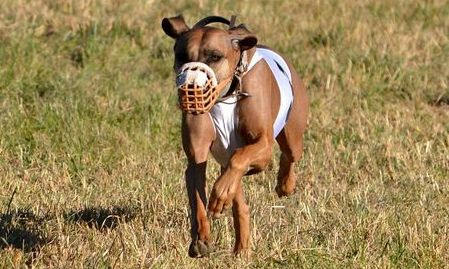 20150411 Reserve to the Major under Judge Paula Nykiel in Harrisburg, PA.
20161112 Ember competed in her first LGRA race meet. She earned a first placement with competition! Hydes, MD. 20170326 - First place and Best of Breed at ASFA field trial (12 points) in Pennsville, New Jersey at JRRWA to earn her field Championship!. 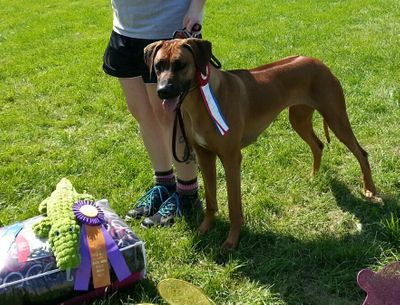 Ember earned her AKC Championship with three majors all OWNER-HANDLED by myself. 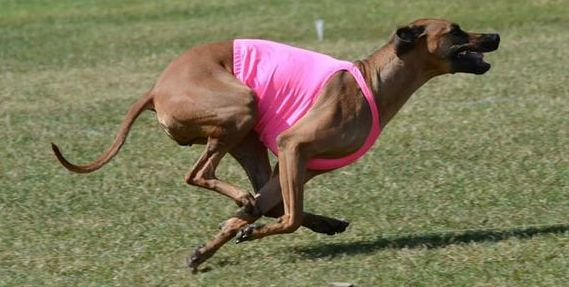 Ember loves to run, and if she didn't love it so much, I wouldn't even try to take her. She barks at the lure and vibrates at the line. There is nothing else in life that makes her happier. Above photos courtesy of Shody Lytle. 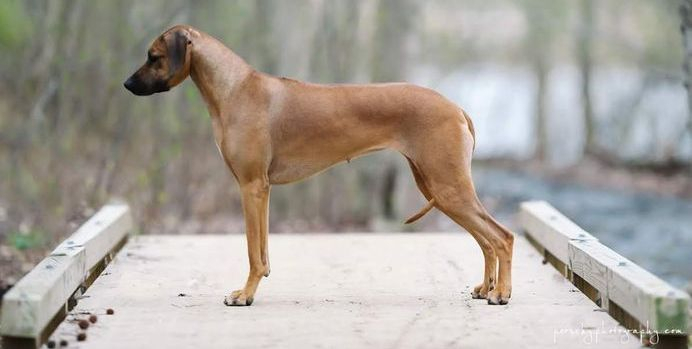 Ember at three years of age. Ember above is in blue.